In development with Seven Studios (Legion: Legend of Excalibur, Defender), Activision is moving forward with a multi-platform game based on Marvel's greatest comic book teams. Slated for a near simultaneous summer release (on GameCube, PlayStation 2 and Xbox) along with the movie on which it's based, Activision's one-to two-player action title enables gamers the chance to handle The Human Torch, Ben Grimm, Mr. Fantastic, and the Invisible Girl. Using the slightly altered origin from the movie (in which the foursome are on Victor Von Doom's research space station), the group is exposed to cosmic rays, altering its very genetic makeup and rendering each uniquely super-humans. Johnny can manipulate fire, Sue telekinetics and invisibility, Reed transforms into a human rubber band, and Ben becomes an oddity of rock-muscle and power. Using a cinematic third-person camera that changes from fixed to moving positions, the game enables players to alternately switch from two to four of the team members. The first level demonstrates how each character learns their unique powers, and tasks them with escaping from Doom's research hospital. The following levels switch from two to four characters and progressively throw more difficult enemies on screen. As you would expect, the characters play to their own unique strengths. Ben is uncomplicated: for him, it's always clobbering time. He easily lifts objects like trees and lampposts to swat enemies like flies. Additionally, he delivers rabbit punches, suplexes, and can grapple enemies. Reed combines close-range attacks with long-range throws; he can transform his limbs into objects such as hammers to attack enemies and useful tools to unlock doors. The Human Torch is good for long-range attacks, using fireballs and walls of flame to create space between the four and their foes. Using her ability to turn invisible, Sue performs one-hit stealth kills. She's good at close and long-range combat, too, using force blasts, telekinetic throws, and force encapsulation to halt enemies in a split-second. 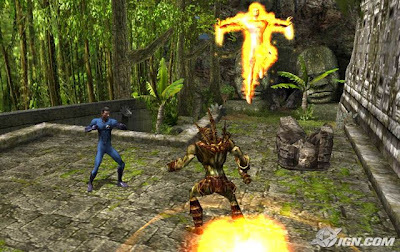 For most of the game, Fantastic Four enables you to play as one or two of the FF members, though in several missions you'll be able to switch to all four. The game strategy evolves from single character action to team-based, strategic encounters, and it features mini-games to challenge players' knowledge and skill of each team member. In other cases, some bosses require complete team work to defeat them. You can even play as characters outside of the Fantastic Four, though exactly who hasn't been revealed. Even if you cannot play the enemies themselves, you will see classic rivals from the fabled four's comic book past, including arch enemy Dr. Doom, Annihilus, Diablo, and Puppet Master. One of the more satisfying elements is that each character is capable of 40 moves, nearly all of which are upgradeable with significantly different moves. Players earn points manually attributed to each character's skill set, meaning that, if you have the points, you can upgrade any one at any time. Visually, the characters' traits manifest in numerous ways, with Johnny showing off a heat blur, Reed's head stretching out backward as he's socked in the jaw, and Sue's telekinetic shield blocking and reflecting enemy projectiles. Electronic Arts announced recently that Marvel Nemesis: Rise of the Imperfects under the EA GAMES brand will be released this fall for the PlayStation 2 computer entertainment system, Xbox videogame system from Microsoft, the Nintendo GameCube and the PSP handheld entertainment system. The game will feature Super Heroes from the Marvel Universe as well as a new set of characters created through collaboration with EA and top comic book industry talent. Ames Kirshen, Director Of Video Game Development at Marvel Enterprises, added, "We are thrilled to be working with EA and collaborating with some of the top talents in both the videogame and comic book industries in creating this groundbreaking comic series and innovative fighting game franchise." EA is calling on the talent of top comic book writers and concept artists, such as Jae Lee, for Marvel character and game design as well as renowned artist, Paul Catling, among other industry talents, to create a new family of Super Heroes that will go face to face with an all-star line-up of Marvel characters for the ultimate showdown. Lee has illustrated high-profile comic book titles including Spider-Man, Uncanny X-men, X-Factor, Captain America, Transformers Versus G.I. Joe and his own creation Hellshock. Catling is best known for his concept artwork and character design on Hollywood blockbuster films including Spider-Man 2, AVP: Alien Vs. Predator, The Punisher, Harry Potter and the Chamber of Secrets and Lara Croft: Tomb Raider. Marvel Nemesis: Rise of the Imperfects will feature more than a dozen fighters in fully interactive and destructible environments. Gamers will have full control over the individual characters with each fighter having unique attributes and super powers that are true to their background adding more depth and fighting strategy to the game. The Marvel Nemesis: Rise of the Imperfects videogame also spawned the new Marvel six issue mini-series, Marvel Nemesis: The Imperfects™, launching this May. In the comic book, Marvel Super Heroes including Spider-Man, Wolverine, The Thing and Elektra clash with EA’s Niles Van Roekel, an evil alien scientist out to create a super army of vicious warriors. Through the comic books, the new EA characters will be unveiled each month leading up to the launch of the game. The Imperfects serves as a prequel to the game and is being written by capable Marvel scribe Greg Pak (X-Men: Phoenix - Endsong). The only in game images shown so far are one on one combat. Added to that, EA Canada is producing the title, so here's to hoping this doesn't turn out being Def Jam Fight 4 New York with Marvel characters. Nothing against that game, but fans would like to have a fresh experience here. March 21, 2005 Majesco, a provider of diversified offerings and content for digital entertainment platforms, today announced it will publish the video game adaptation of the popular comic book series, The Darkness, for the next generation of consoles. Scheduled for release in 2006, The Darkness is being developed by Starbreeze, the acclaimed development studio behind the top-selling video game, The Chronicles of Riddick: Escape from Butcher Bay. Based on the best-selling Top Cow comic book, The Darkness casts players as Jackie Estacado, a fearless Mafia hitman for the Franchetti crime family who is suddenly possessed by the terrifying and spectacular powers of The Darkness. Throughout the game, players must learn to control and harness The Darkness power in order to overthrow the vicious mob boss and fulfill their destiny. "We are excited to have secured Starbreeze, a highly talented and respected team, to develop one of our first titles for the next generation of video game consoles," said Jesse Sutton, president of Majesco. "Combining the top-tier development talent and technology of Starbreeze with the compelling content of Top Cow's The Darkness comic book series provides a solid foundation for success." The Darkness features a seamless and unique blend of modern crime drama and supernatural horror through first and third-person, non-linear gameplay. Utilizing the Starbreeze engine for next generation consoles, The Darkness features single and online multi-player action across highly realistic environments. Union Entertainment, a feature film and video game production company, packaged the deal which includes Paul Jenkins, a seminal writer in The Darkness comic book series, who will provide game story and dialogue. The Darkness comic book series launched in 1996 and is currently published in 19 different languages around the world. The highly popular comic sells more than 500,000 copies of each issue and generates more than $25 million annually across its various brand extensions. "The Darkness" live action film, produced by Platinum Studios and Dimension Films, is estimated for release in 2007. Based on Marvel's popular Ultimate Spider-Man series, Activision's next Spidey game puts you in the role of a very young Peter Parker. Uncertain about his role as a superhero and featuring the kind of acerbic wit not seen in the movie versions, this is a very "human" Spider-Man. With Brian Michael Bendis (Ultimate Spider-Man, Powers) set to script Spidey's ultimate adventure, this should be quite a unique title in the web-head's video game collection. Villains are unknown, but if the game follows the comic in any way, expect every evil-doer who meets the wall-crawler to figure out Spider-Man is really Peter Parker. We should learn a lot more at E3 2005. Though the title may be deceiving (and will likely see a change long before release), this is not a collection of classic Spider-Man videogames. Instead, Spider-Man Classic puts you in the role of the traditional Spider-Man. This has no association with the Sony Pictures films, though it's not clear what significant difference will be seen (aside from Spidey having to build his own web shooters). Villains and allies have yet to be announced, but we're certain it takes place in Manhattan. At least that's something. Based on the third movie, which is set to release in mid-May of 2007, Spider-Man 3 will likely offer a similar design to 2004's Spider-Man 2, with a wide-open New York City to explore. Rumors peg the Lizard and the Green Goblin (this time Harry Osborn) as the villains of the film, which would in turn make them the baddies in the video game. Don't expect to hear anything on this one for a long, long time, but it has been confirmed so start saving now. Shortly after the release of X-Men Legends, Activision announced a sequel. Likely to come out later this year, Legends 2 uses the same engine as the original, but introduces new characters not seen in the first game. This time around, development is expected to focus on four-player gameplay, alleviating the issues of the original Legends, which sometimes forced gamer's to play solo. The storyline and further details remain a secret for now, but look for news later this spring. Almost nothing is known about EA's upcoming fighter. What we can tell you is that it will feature a variety of characters from the Marvel Universe and numerous original characters created by EA specifically for this fighting game. Considering the current standard for fighters, it's likely that Marvel Vs. EA will be playable online on Xbox and PS2. It's also a safe bet that some familiar EA characters are set to make an appearance. Final Boss: Madden? Dare to dream. LOS ANGELES--March 21, 2005--The Electronic Entertainment Expo (E3Expo), the world's premier computer and video game trade event, has sold out of exhibit space for this year's show, making 2005 the fastest sell-out in five years. The Entertainment Software Association (ESA) announced today that to date, E3Expo 2005 has sold more than 540,000 net square feet of exhibit space covering five exhibit halls in the Los Angeles Convention Center, the largest amount of space sold since 2000. "E3Expo 2005 brings us to the threshold of a new era of creative and technological innovation for the global computer and video game business, providing first looks at the next generation of hardware and previews of the advanced titles and technologies that consumers will be bringing home this holiday season," said Douglas Lowenstein, president of the ESA, the trade association that represents U.S. computer and video game publishers and owns E3Expo. "With a show floor the size of 2,700 city blocks, an unparalleled business conference program, and more than 400 exhibitors from 87 countries, E3Expo is truly the best place on the planet to get down to the business of fun." E3Expo 2005 will offer an unparalleled panel of 150 industry leaders who will share their knowledge during 34 educational conference sessions and workshops. E3Expo, now in its eleventh year, is scheduled to take place at the Los Angeles Convention Center on May 17-19 for conference program and workshops, and May 18-20 for exhibits.